- Telegram is free (as in beer, but also as in freedom). Protocols are open and clients are GPLv2. - Communications are encrypted, and also end to end encryption is supported. - You can use it on Android and iOS devices, but there are also unofficial clients for PCs (and as it's open, you can build it for your RaspberryPi powered toaster if you want). Make sure to read the documentation, or at least type "help" in the prompt and read the available commands. Also make sure you are connected to the Internet before launching, or it will instantly close. 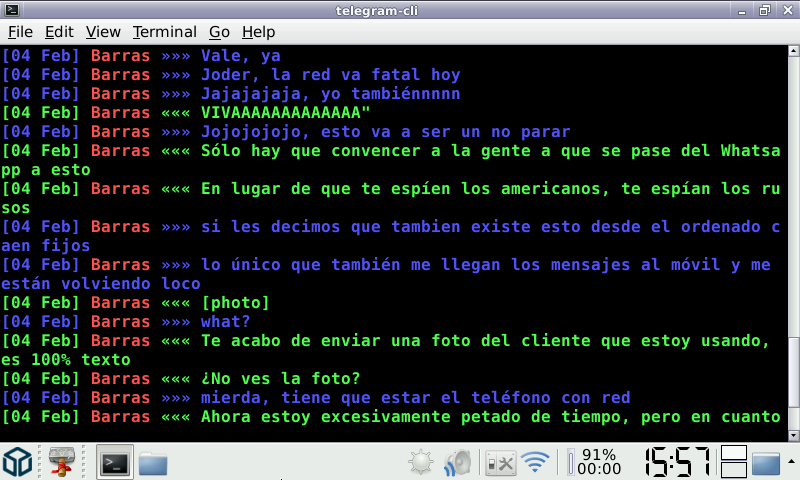 Command line interface (CLI) Telegram client. Telegram is like SMS, but more powerful. You can send messages, photos, videos and documents to people who are in your phone contacts (and have Telegram). You can also create groups for up to 200 people. Telegram is pretty similar to WhatsApp, but has some advantages: - Telegram is free (as in beer, but also as in freedom). Protocols are open and clients are GPLv2. - Communications are encrypted, and also end to end encryption is supported. - You can use it on Android and iOS devices, but there are also unofficial clients for PCs (and as it's open, you can build it for your RaspberryPi powered toaster if you want). Make sure to read the documentation, or at least type "help" in the prompt and read the available commands. Also make sure you are connected to the Internet before launching, or it will instantly close. Deleting messages isn't yet supported by this client. You can delete them using Android/iOS clients though. @nobgu: It's not that hard. Just write (without the quotes) "msg [contact_name] [message]" to send [message] to [contact_name]. The client supports auto completing using the tab key, make sure you use it. Note that while it claims to respect your privacy, telegram is not safe to use if you want to have true private conversations. There are issues with the way it is designed.